The political crisis in the North deepened this week when a bomb attack struck the British Army’s Palace Barracks, the headquarters of MI5 in Ireland. 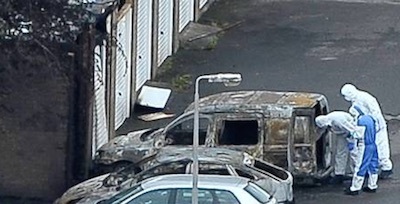 The bomb exploded inside a van, from which a fire spread to a number of nearby vehicles and garages. There were no reports of any injuries. British Direct Ruler Therese Villiers described the attack as “reckless and futile”, and Stormont politicians were also quick to condemn it. The Palace Barracks complex in Holywood, County Down is the main back-up to MI5 headquarters in London and is its largest base outside the English capital, with over 1,000 agents. Soldiers from The Royal Scots Borderers have also been stationed at the base since August 2014, which has one of the highest levels of security of any British military installation in Ireland. All vehicles entering are searched, and anyone regularly entering the building must be first subject to background security checks. Friday’s attack represents a major breach of that security and shows that despite the best efforts of the British military, nowhere is beyond the reach of the breakaway IRA groups. Significant planning will have gone into such an operation to ensure the device made it through security undetected. Although the bomb was not large, it has undoubtedly caused further embarrassment for the PSNI, British military and intelligence chiefs. Five years ago, a bomb containing between 40lbs and 50lbs of explosive was driven to the same barracks and set off. Spy cameras hidden in trees were later found to have been gathering information on the #20m base. Following that attack, security was supposed to have been stepped up. Friday’s attack has followed an escalation in armed actions in the North, all without causing injury. A bomb which exploded in a roadside bin in Derry on Tuesday night was described as having “all the hallmarks” of an IRA attack, according to the PSNI. The area around the Skeoge Road was sealed off following reports of a loud explosion in the Galliagh are. It was initially thought that a gas cylinder had been thrown onto a bonfire. However, the PSNI later confirmed the noise was the result of a roadside bomb. Last week, a mortar rocket was also found during a major two-day security operation at the graveyard in the Townsend Street area of the County Tyrone town of Strabane. The PSNI said the bomb was “viable” and could easily have been used to mount an attack.